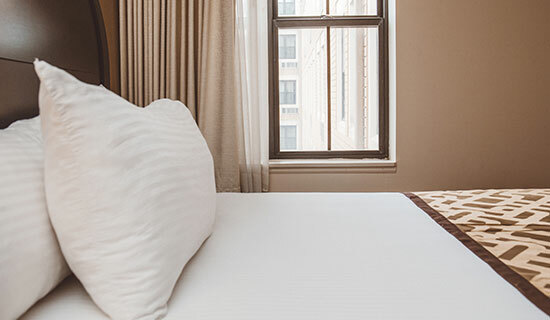 A boutique hotel with spacious guestrooms, contemporary decor and modern amenities is what you'll find waiting for you at the Chicago South Loop Hotel. 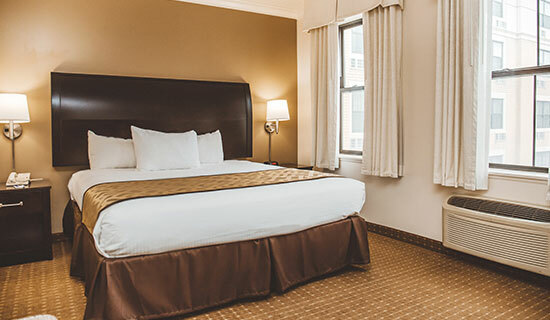 Our oversized guestrooms were recently upgraded for both comfort and convenience to help you unwind and relax in the heart of Chicago. Settle in with deluxe room amenities offering brand new plush mattresses, box springs, bedding, and draperies, crisp linens, complimentary Wi-Fi, 32-inch flat-screen televisions, ergonomic workstations, seating areas with club chairs, deep soaking tubs, and a menu of other features all designed to ensure you'll have a comfortable stay in the Windy City. "A Boutique Hotel Retreat in the Heart of Chicago's South Loop"
Settle in to one of our inviting King Rooms, featuring stylish decor, a plush king-sized bed, crisp linens, 32-inch LCD flat-screen televisions with premium cable channels, ergonomic workstations, complimentary Wi-Fi, deep soaker tubs, fluffy towels, coffee makers, mini-fridges, and a fresh, smoke-free environment. 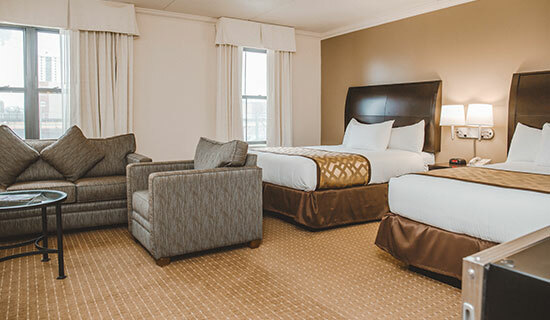 Relax in to one of our spacious Queen Rooms, featuring modern decor, a plush queen-sized bed, crisp linens, 32-inch LCD flat-screen televisions with premium cable channels, ergonomic workstations, complimentary Wi-Fi, deep soaker tubs, fluffy towels, coffee makers, mini-fridges, and a clean, smoke-free environment. 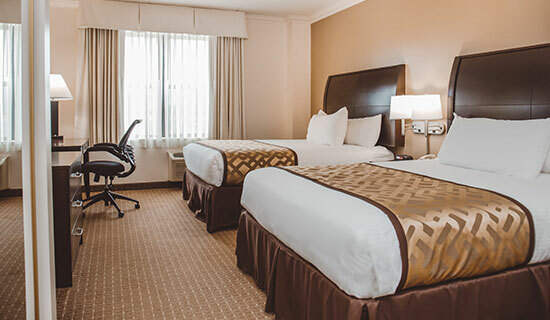 Unwind in one of our oversized, smoke-free Double Queen Rooms, featuring two plush queen-sized beds, crisp linens, 32-inch LCD flat-screen televisions with premium cable, seating areas with club chairs, ergonomic workstations, complimentary Wi-Fi, deep soaker tubs, fluffy towels, coffee makers, and mini-fridges. 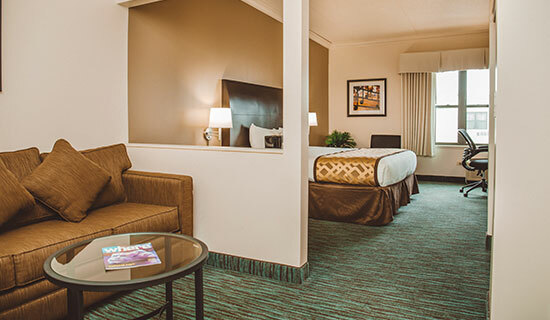 Unwind in one of our oversized, smoke-free Deluxe Double Queen Rooms, featuring two plush queen-sized beds, a small sofa, 2 chairs, a coffee table, crisp linens, 32-inch LCD flat-screen televisions with premium cable, seating areas with club chairs, ergonomic workstations, complimentary Wi-Fi, deep soaker tubs, fluffy towels, coffee makers, and mini-fridges. Settle in to one of our plush Deluxe King Rooms, featuring a small sofa, 2 chairs, and a coffee table, stylish decor, a plush king-sized bed, crisp linens, 32-inch LCD flat-screen televisions with premium cable channels, ergonomic workstations, complimentary Wi-Fi, deep soaker tubs, fluffy towels, coffee makers, mini-fridges, and a fresh, smoke-free environment. Featuring an even larger living space than the Deluxe Queen plus two walls of windows for top notch views of the city. 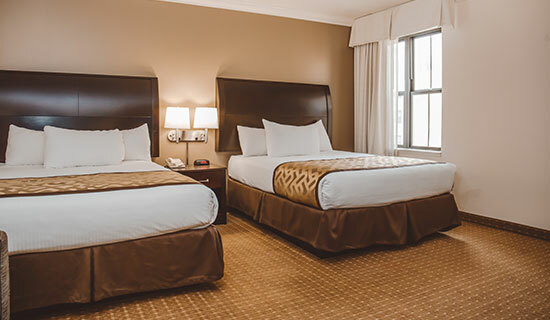 Other room amenities include two plush queen-sized beds, a small sofa, 2 chairs, a coffee table, crisp linens, 32-inch LCD flat-screen televisions with premium cable, seating areas with club chairs, ergonomic workstations, complimentary Wi-Fi, deep soaker tubs, fluffy towels, coffee makers, and mini-fridges.